This week on Developer Labs, we’re showing you how the Leap Motion Controller is reaching new places – from major retailers to the operating room. Plus, a round of framework updates, more thoughts on menu design, a robotic hand, touchless LED color control, and animating hand gestures in Autodesk Maya. Around the world, the Leap Motion Controller is appearing on more retail shelves and online stores. Recently, we’ve added US e-retailer Newegg.com, French retailer Fnac, and Best Buy and Future Shop locations in Canada to our growing list of retail partners – with millions of new customers and 315 brick-and-mortar outlets. In one fell swoop, logotype updated the repos for three of his projects – frameworks for TypeScript, DART, and ActionScript. To tap or not to tap? Following Jon Altschuler’s thoughts on menu design on Developer Labs last week, Oliver Noelting wrote a post comparing the pros and cons of 7 different menu methods. Prashant_Rao used the Leap Motion Controller to control the fingers of an i-limb prosthetic arm – part of a project to bring new mobility options to people with disabilities. 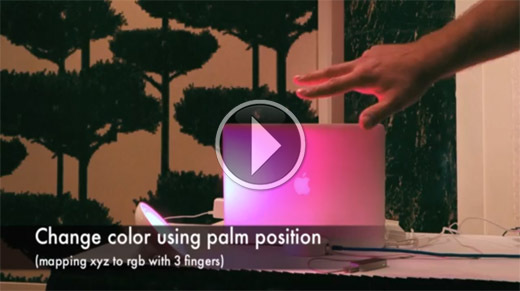 Kai Kreuzer and the amazing technicolor lamp experiment. Last week, the founder of openHAB shared this video of an LED lamp integrated with the Leap Motion Controller. Besides switching on/off, dimming, and circling through colors, you can also control the color in 3D – with your palm’s XYZ coordinates mapped to RGB values. Read more on the Leap Motion blog. 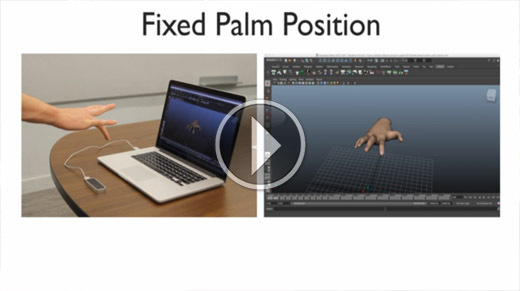 Michael Rivera shared a video about his framework for animating hand gestures in Autodesk Maya – codenamed Project PAALM.